On today’s Happy Daily: Brian tries to bring the world together. Happy Daily 074 – Happy day from 1992! On today’s Happy Daily: We travel back in time! On today’s Happy Daily: The next installment of the Cheshire Vannoy epic, Cereal. Happy Daily 072 – Brian is dreading next weekend. Find out why. On today’s Happy Daily: Brian is really dreading next weekend. On today’s Happy Daily: Brian tells you what to do after you create your podcast. 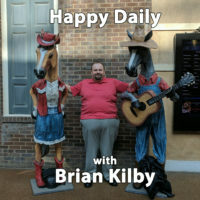 On today’s Happy Daily: Brian gives Wilkes County a stern talking to. On today’s Happy Daily: A special message for all those people out there that need to hear it. On today’s Happy Daily: Brian talks about the storm that blew through Wilkes County on Monday. On today’s Happy Daily: Kim wants to go on the Family Feud. What do y’all think? Also on the show, Brian continues his series on How to Make a Podcast. On today’s Happy Daily: We continue with our story that began last week. It’s Cereal Part 2!